Collins offers a sleek design with the charm of cimplicity. Delta's DIAMOND Seal Technology provides a pure water delivery system. Our InnoFlex waterways are crosslinked with an electron beam versus using chemicals to eliminate the potential of adding unpleasant odours or taste. This Essa Single-Handle Bar Faucet in Arctic Stainless with MagnaTite Docking features a soft contemporary take on a euro design with subtle detailing accents that allow the faucet to blend with contemporary and transitional design. The pull-down spray wand comes free with a gentle tug and gives you total flexibility. The hose extends and retracts without friction points, fed by gravity. As you raise the wand to dock it, the magnet embedded in the spout pulls the wand precisely into place. So, unlike other pull-downs that tend to droop over time, MagnaTite. keeps your pull-down faucet looking picture-perfect. Delta's exclusive DIAMOND Seal. Technology uses a valve with a tough diamond coating. InnoFlex. PEX waterways keep water inside the faucet out of contact with potential metal contaminants. This powerful combination brings you a faucet built to last up to five million uses. Beverage Faucet - Traditional, Arctic Stainless Delta's exclusive DIAMOND Seal<sup></sup> Technology uses a valve with a tough diamond coating. InnoFlex<sup></sup> PEX waterways keep water inside the faucet out of contact with potential metal contaminants. This powerful combination brings you a faucet built to last up to five million uses. Only Delta faucets are equipped with Touch-Clean<sup></sup> soft, rubber nubbins that allow you to easily wipe away calcium and lime build-up with the touch of a finger. The included escutcheon completes the ensemble for a more finished look. 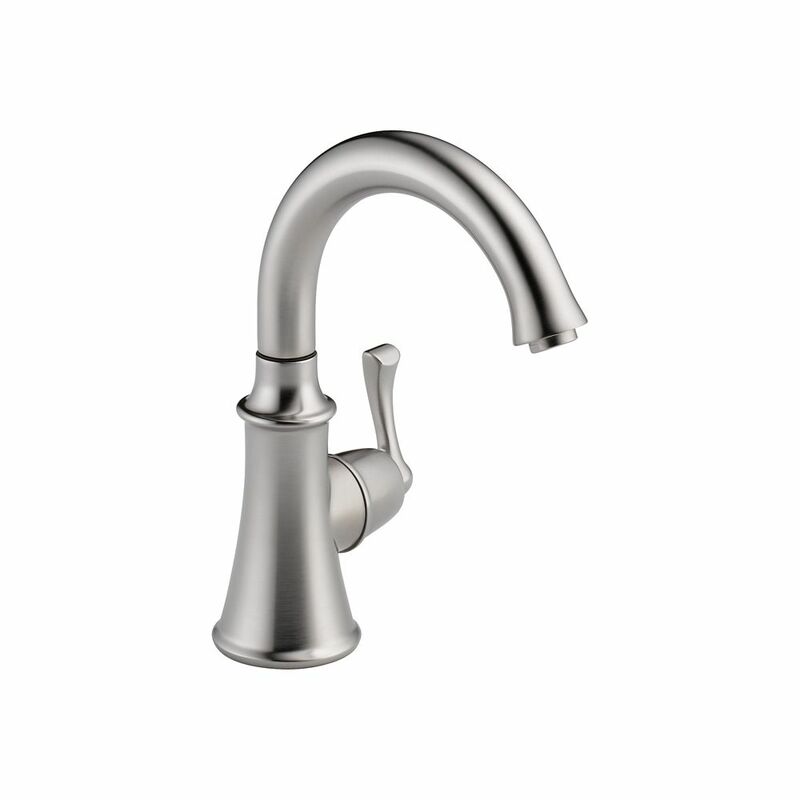 Beverage Faucet - Traditional, Arctic Stainless is rated 4.7 out of 5 by 26. Rated 5 out of 5 by HomeDepotCustomer from This faucet looks great and functions smoothly. We had it... This faucet looks great and functions smoothly. We had it professionally installed by a plumber only a week ago so I can’t speak to its longevity or reliability but so far so good. Rated 5 out of 5 by MandyG from Beautiful in our kitchen with our other Delta faucet. Easy... Beautiful in our kitchen with our other Delta faucet. Easy to use. We are using this with our RO system. Rated 5 out of 5 by HomeDepotCustomer from I replaced an existing Culligan RO faucet with this faucet.... I replaced an existing Culligan RO faucet with this faucet. I purchased an inexpensive PEX tubing cutter and obtained a new connector from Culligan. The install was simple even for a non-plumber. Rated 5 out of 5 by Robert from Perfect match to our other Delta faucets. ... Perfect match to our other Delta faucets. Rated 5 out of 5 by deltaqueen from Terrific product...love it. Solid, well made and works perfect. Looks great. Exceeded expectatio... Terrific product...love it. Solid, well made and works perfect. Looks great. Exceeded expectations! Purchased early October 2017. Rated 5 out of 5 by CLAMPITUP from Great 'posture' and solid faucet. Matches adjacent fixtures perfectly.... Great 'posture' and solid faucet. Matches adjacent fixtures perfectly.